On Tuesday evening, April 11, two Wawasee school board members (Rob Fisher and Don Bokhart) along with a few others including two principals (Vince Beasley, assistant principal at Wawasee High School and Eric Speicher, Syracuse Elementary principal) were led by Dr. Tom Edington, superintendent, on a tour of the new school located on Kern Road near the high school. The tour started in the back of the school near the boiler room. A large water heater just delivered Tuesday to replace a malfunctioning unit sat waiting to be installed. Only a small boiler will be used to heat the building because mostly geothermal will be used. In the upstairs area is much of the mechanical equipment including the air units. The tour moved to the kitchen area where some of the equipment has been installed. The cafeteria will be considerably larger than the one in the current school and will be capable of seating two grade levels at the same time. There will be TV monitors on the walls in the cafeteria. The art room will include a separate kiln room. There will be one eating room for the teachers. A reading “nook” or corner is included in the media center. Other areas covered in the tour included the main computer room where computers needing work or maintenance will be dropped off. The second grade and kindergarten wings were toured too. Classrooms will have carpeting. And the gymnasium and office areas were visited. The gym, already brightly lit, is large and will be capable of holding two activities or events at the same time. 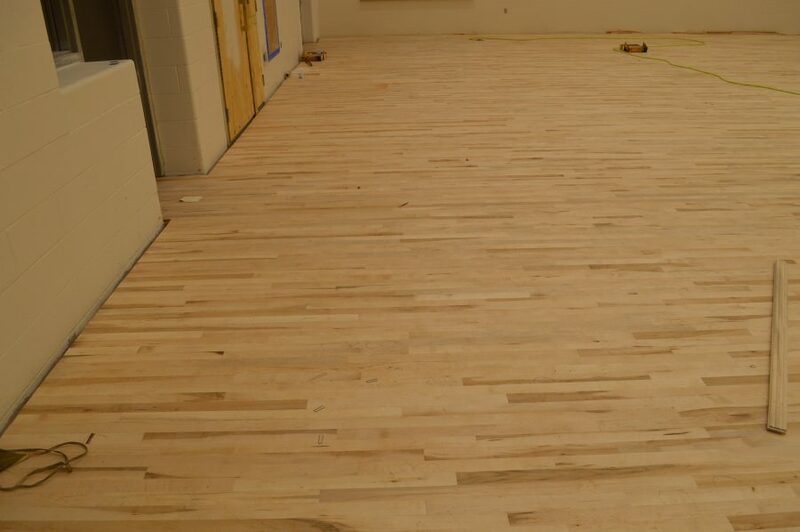 By Tuesday evening, about half of the maple hardwood had been installed for the gym flooring. It will need to be sanded and finished. Nearly 100 percent of the outside of the building has been finished. Possibly only a few punch list items will remain to be completed. Most of the mechanical equipment has been installed and water service is available. 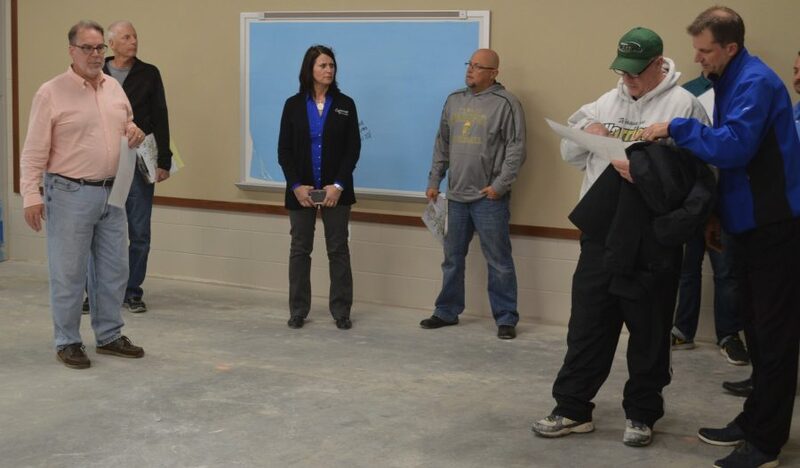 Now workers are focusing on finishing floors and going into the classrooms, gym, kitchen, cafeteria and media center. Technology will begin to arrive in May. According to Dr. Edington, the school corporation will be given possession of the building in early July. That will leave only a few weeks to put furniture together and move things in to the building. Work is still progressing ahead of schedule. 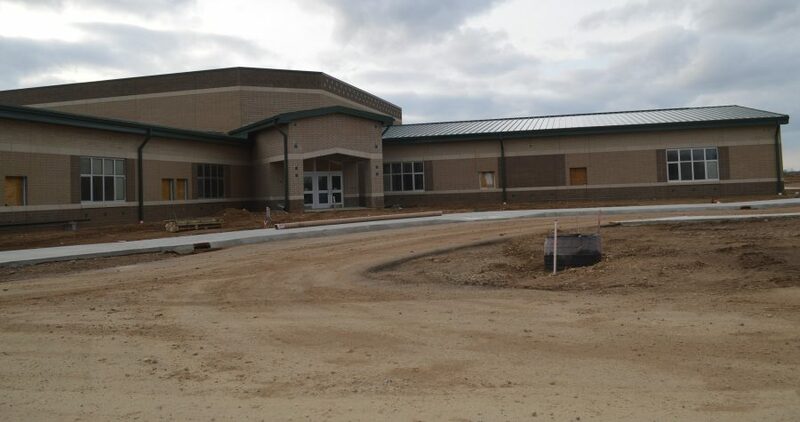 Main entrance of the new Syracuse Elementary. Hardwood flooring in the gym.